A famous writing saying is to write what you love. There is a lot of practical, common sense to this. If you are excited about the subject matter you are writing on, chances are others will be excited when they read about it. In fact, most of what I write is about something I am really interested in. That’s why I do a lot of kids writing. My interests are: animals, kids, babies (not hard to figure that out right now), science fiction, fantasy, fairy tales, literature, spiritual things and cooking. As I look through the list of things I’ve written, I find that my first published work was a short story about two kids and a dog, “Snow Treasure.” It contains three of my interests: spiritual things, kids and animals. My one and only story for Daily Science Fiction, A Little Piece of Heaven, contains three of my interests also, animals, science fiction and spiritual things. I can go on and on with my list of published work and find that most contain at least two of the criteria for my interests. It’s interesting to note that I succeed most at publishing something I’ve written when I’m most excited about the content. Can you write about something you don’t have as much interest in and get it published? Sure. I hate math, but I wrote an article that was very mathematical. In fact, I didn’t completely understand all I wrote. It was called “How many Petals on a Daisy” and it was published in GAK. From my research I developed an interest in the number of petals on different types of flowers. So I wrote the article. As a writer, you need to keep growing, even in things you may not initially have an interest or knowledge in, especially if you are writing a novel. Something will come up. Oh, there’s a fight in my story. I don’t like fighting, but I need to write a fight scene. There’s computer information in my story. I don’t know much about computers and how they work. I need to find out how they work. Sometimes research over the internet works, but often times you have to talk to somebody who knows their stuff. This is something I have trouble with. I don’t like to talk to people. I’m a loner. But a writer has to stretch themselves a bit when they want to excel at what they do. Write about what you love? Sure. But try writing about something new, too. You might be surprised at the results and about what you learned in the process. The old fashioned way. Typing. The other day I was talking to one of my best friends and she mentioned the word sundries. She thought it was a cool word and I did too, so I’m stealing it for my blog today, because it is all about sundries. My first Sundry is this poem I wrote about my Grandma. It was written a long time ago in memorial of her life. She was always laughing and smiling. She had 12 living children and still managed to laugh. If I had that many children my laughter would be from insanity. I wrote two poems about her and this was the second. I am sharing the first one also. This poem reminds me of the importance of family. I love Christmas but when I lost the person I loved, Christmas did not seem so appealing. In fact, it was downright depressing. I’ve found this to be true not only with death but when someone I loved moved away. I had a hard time finding any joy in my life after that. So those are my first two sundries. My next sundry is good news and bad news. The good news is my fairy tale story about Sleeping Beauty was accepted at Enchanted Conversation. Yay. I’m so happy to be getting good news. Because last week I got bad news. Although my story for Daily Science Fiction had been short listed, which is truly amazing, it ultimately was not picked. They added a little note to the rejection, A difficult decision. It made me feel a little better, but it was still hard. My third sundry is my story for Guardian Angel Kids is in the June issue. It is also about grandmas, so it fits in well with this blog post. My poem talks about angels in Heaven and the story is about angels and grandmas. How cool is that? With writing, you have to take the good with the bad. Although I was disappointed and it had me depressed thinking about my story for Daily Science Fiction, I just told myself that there will be other opportunities. Keep on keeping on. She’s the only one I had! For the warmth of Grandma’s kiss. Or in spring’s day so fair. Her features are so fine! And in the stars that shine. In every kind of place. Because that was Grandma’s way. In flowers, lakes and trees. As a cool and gentle breeze. But some things I’ll always see. Will always be here with me. I sometimes wonder what winter thinks it’s doing when it rears its ugly head in March. Just when I was thinking daffodils and hyacinths, it dumps a foot of snow on us. We’ve had more cold and snow than our share these last months. I haven’t even seen one crocus this year. 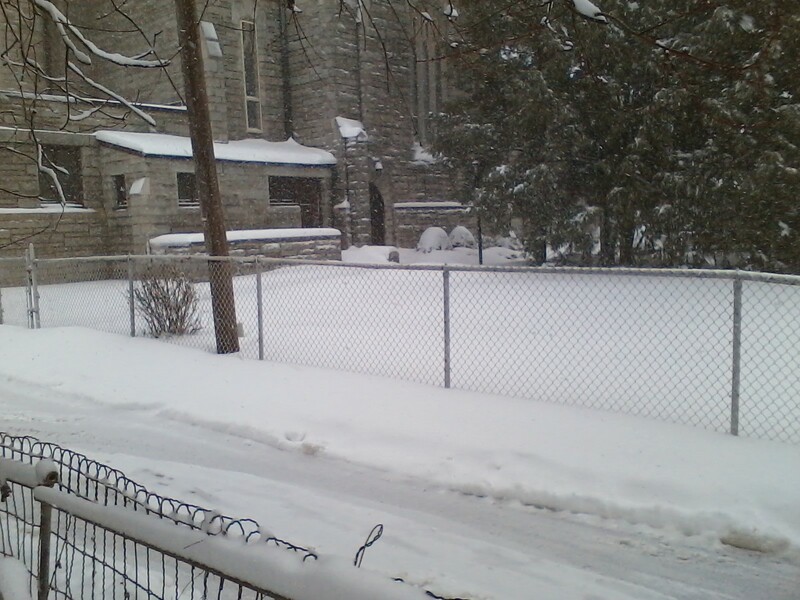 The weatherman said it was winter’s last gasp but after a foot of snow, I recognize it for what it is; an angry roar. I’ve also had two rejections; one from Daily Science Fiction and one from Cricket, which makes me feel, need I say it, mediocre. 1. Write for a theme. Sometimes I can’t for the life of me come up with one lousy idea on my own until a magazine says write on this theme. Then, I say Ahhh, I think I’ve got it. 2. Use writing prompts. Writings prompts get the juices flowing. 3. Read all/most of what you’ve written last. If I’m working on a novel, sometimes reading a good portion of it makes me think what to write next. 4. Work on something new. Let’s face it. We’re all out with the old, in with the new. Sometimes the old is boring, so writing something new motivates us. After you’ve been away from the old for awhile it may become new again. 5. Meditate. When I meditate I often come up with writing ideas or the next part of my manuscript. 6. Write those random thoughts down. Whatever they are, you are at least writing. So beat winter’s angry roar with a roar of your own. I just finished a book by one of my more favorite authors, Roald Dahl. It’s a book of his short stories. I particularly enjoyed “The Swan”, a story about a boy being bullied by two other boys. It has the kind of fantasy ending I love in his books. I’ve read many books by Dahl and I love every single one of them. I read them aloud to my kids and they loved them, too. In case you can’t quite place Dahl, he is the author of Charlie and the Chocolate Factory, and James and the Giant Peach. But what I really loved about this book is that the last story was autobiographical and told how Dahl became a writer. It’s a wonder and fantasy in itself. Dahl never thought of becoming a writer. He says when he looks back on his papers at school, they contain little notes like he was incapable of putting his thoughts on paper, and his sentences were mal-constructed. My favorite note was that he reminded them of a camel. So, he didn’t pursue writing. He went to the British Air Force and did several missions in WWII. He had a few other adventurous jobs as well. But finally, he developed headaches and ended up working in America in the British embassy, a desk job. Here’s his lucky break, the title of the story. A man comes in and wants to interview him. He says he can’t fight in the war but he can write stories for the war effort and anything he writes the Saturday Evening Post will take. He’d like to interview Dahl. The man’s name is CS Forester. Wow! So he goes to an interview/dinner with Forester and he does poorly talking his way through his story. So, he finally says, “I’ll write it down for you. Don’t expect too much” which suits Forester. He writes his story down that night, sends it off and forgets all about it. Two weeks later, he receives a letter from Forester, “I thought you were only going to give me the facts. Do you know you’re a very gifted writer? I sent it off untouched to my agent. The Saturday Evening Post took it. Here’s your check for $900 and they want more.” I think this is every writer’s dream story. This incident made me wonder why do some great writers get immediately recognized and others just plow their way through the writing world with few if any accolades at all. Despite being all out envious of Dahl’s lucky break, I still loved his writer’s story. One of the things he mentions is that a writer needs humility. He seems to have an abundance of this despite his great talent. I received a rejection from Bastion for a story that I originally liked but now after reading their comments, I am ready to toss in the proverbial trash can. Have you ever had that happen? Sometimes editor comments make you see your story in an entirely different light. They kept using the term “flat” and told me it needs work and more showing and less telling. Honestly, I thought there was a lot of showing in this story. Also, after they described the story to me, it sounded totally preposterous. I’m sure that’s how they wanted me to see it. I did get some writing in this week, and I submitted to two places, Daily Science Fiction and Guardian Angel kids. I have a story almost ready to be sent to Guide magazine and one I’m thinking of sending to Aurora Wolf but I’m not sure. Try all these places yourself. Here’s the links: dailysciencefiction.com, http://www.guardian-angel-kids.com/ http://guidemagazine.org/ and http://aurorawolf.com/ Remember if you like to write stories or articles for kids and want to submit to Guardian Angel kids, the issues are themed. Please check out the themes for each month. The deadline for the next window is December first and the theme is Wild, wild west. Thought for the Day: Be inspired by another writer’s story. Also, take some lessons from their advice. If they succeeded, so can you. What does a writer get excited about? Mostly, they get excited about publications and acceptances. Well, I’ve found a lot of new things to be excited about as a writer. For instance, I’ve had my first cover story in a printed magazine. Okay, it’s not the Atlantic or the New Yorker or something earth shattering. 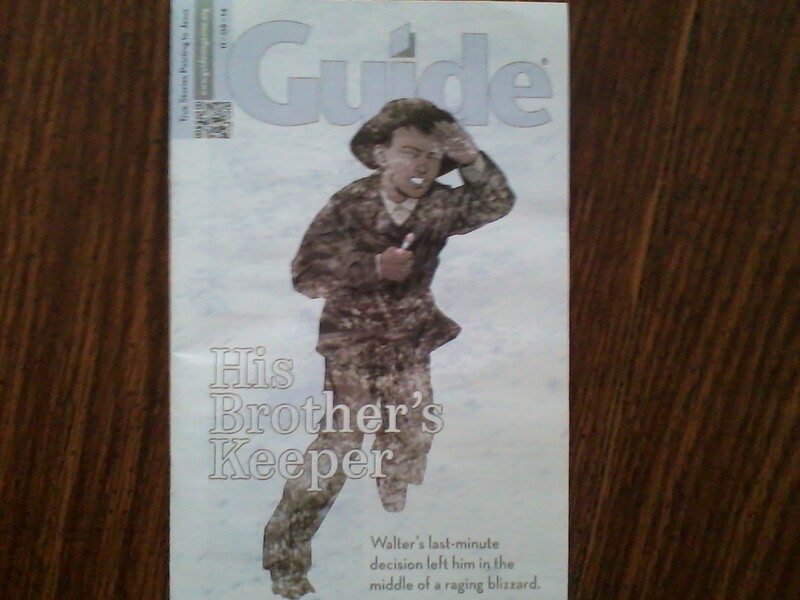 It’s Guide Magazine, a Christian kids’ magazine, but I’m still excited. The illustration of my story made the cover. Wow! Also, I am excited because TA-Da! Finally, my Daily Science Fiction story is going to be posted. The big date is Wednesday, Oct 15th, folks! I will be linking to it that day because I am super excited! I’ve been waiting for forever for this. Yes, when I say forever, all the writers out there know exactly what I am talking about. And my good news is not over. I am going to be doing a guest blog on Blogs by Christian Women. Yay! This will be on Monday of next week, so I will have three blogs next week, instead of one. I hope I’m not overplaying my hand. I hate to inundate people with my blogs. I will link to this as well. So, join me Monday, Tuesday and Friday of next week for my good news blogs. Friday, I will be doing my monthly stats for September, a bit late, but I still want to do it. Thought for the day: Make the most of every opportunity as a writer. Stretch your vision, set some goals and go for them. I was thinking of the Robert Frost poem when I wrote this blog. We could have a whole discussion on whether Frost’s take on his taken road was positive or negative in his life but I think the main point is that whatever road you take it can turn out to be a life changing experience. Writing for me has certainly been that. I am so thankful to have taken this path. I am thankful despite the ups and frequent downs I’ve encountered because I write and because I submit. As writers we certainly do take a road less traveled on, although it doesn’t seem that way when you find out thousands of people have tried the same publisher you have. Now for my best, most happy news. I have finally had a story accepted at Daily Science Fiction. This is by far the most prestigious of all my acceptances. I can’t tell you how excited I was when I received word that I had made round two. I didn’t share it on my blog because they let me know that half of those who make it that far don’t make it to final acceptance. But I have! Yay! So rejoice with me. If I can make it, so can you. I don’t know when my story will be posted. Not for awhile I imagine. I haven’t yet received the contract or any edits, but when it is posted, I will certainly share the link. I didn’t write this week. I didn’t submit this week either. I worked and I helped at our church’s Cooking Camp for kids. I really like doing this every year. It’s fun to see kids excited about cooking. I do love to cook but don’t get to do it as much anymore because I work a lot and I have to decide what I want to do most, and of course, that’s writing. My group made lasagna roll ups, chicken corn soup and barbeque. I had the best teen helper in the world, Michael, who has his own garden and greenhouse. He outshines me by far in cooking, and he’s only going into the eighth grade. Next week I hope to tell you I’ve written something and submitted some things. Have a great week and much success in whatever you do. I have to say it’s good to be back doing my regular blog again. I really enjoyed doing Paint Splashes but it’s nice to be able to say my own thing once more and be back in the groove, sharing my writing wrecks and triumphs, even if the triumphs are few and far between and the wrecks are numerous. If I was a vehicle, I’d be non-salvageable by now. Places submitted to this month: UFO, Enchanted Conversation, Photo Flare Contest, Penn Cove, Unfettered, Knowonder!, Guardian Angel Kids and Daily Science Fiction. Other exciting news: I have an author interview coming out on May 6th with Strange Musings Press, who published the anthology. I will include the link when it is out. I also have my author story being published at Flash Fiction Chronicles on May 20th. I will include a link to that as well. May will be a fabulous month for me! Unfortunately, my writing has slacked off a bit. I’m working more hours this month and am a bit frenzied, but I need to step up to the plate and keep batting. Good things are happening. I’ll keep you posted. Thought for the Day: Share your writing story with someone else and encourage them. Good writing friends are inspirational. Thanks for continuing to read my blog. I appreciate all who do. Share this blog with others, if you please. I’d be grateful.